Cortisol, often deemed the "stress hormone, is released by the adrenal gland during times of stress. It has several functions in the body, including blood pressure regulation, glucose mobilization and inflammation reduction. However, chronically high levels of cortisol can impede health by suppressing digestive function, growth processes and reproductive system function. Besides avoiding stressful situations, research hints that certain foods can help lower cortisol levels in the body. Researchers from Hopital de la Cavale Blanche investigated the effects of fish oil, which is rich in omega-3 fatty acids, on stress hormones caused by mental stress. The report, which was published in the June 2003 issue of the journal “Diabetes & Metabolism,” revealed that subjects taking fish oil for three weeks experienced lower cortisol levels on a mental stress test compared to subjects receiving a placebo. 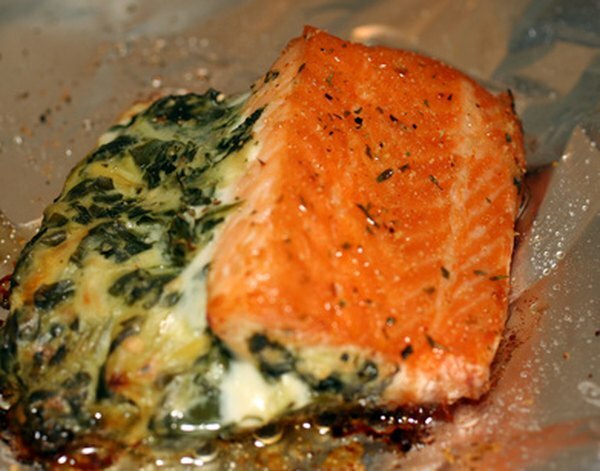 Omega-3 rich foods include halibut, salmon, walnuts and canola oil. Black tea might have positive effects on stress hormones in the body according to a study conducted by lead investigator Andrew Steptoe and colleagues from the University College London. They discovered that subjects drinking four cups of black tea per day for six weeks had lower levels of cortisol after a stressful event compared to those who were administered a placebo. Eating dark chocolate might help relieve stress. Researchers from Nestle Research Center in Switzerland examined the effects of 40 g of dark chocolate on stress metabolism. At the end of the two-week study, which was reported in the December 2009 issue of the “Journal of Proteome Research,” scientists observed that the dark chocolate group experienced decreases in cortisol output compared to the control group. Increasing your intake of vitamin C, which is found in citrus fruits, bell peppers and dark green leafy vegetables, might improve cortisol levels. Lead author Samuel Campbell and colleagues from the University of Alabama discovered that rats given vitamin C supplementation had reduced levels of cortisol after a stressful event compared to those receiving a placebo, according to a report on the Science Daily website.